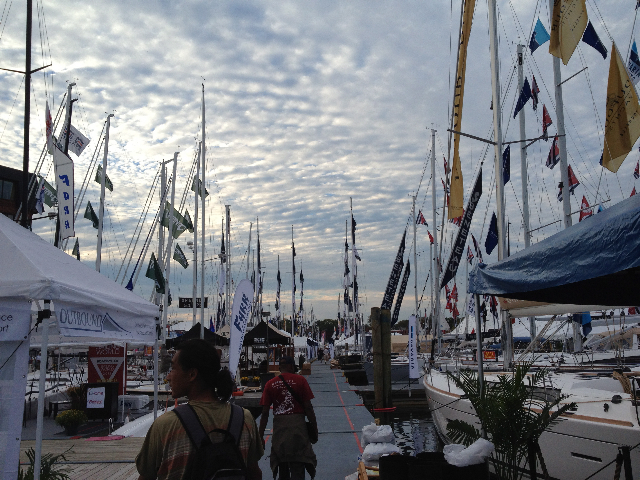 Today is the third day of the ANNAPOLIS BOAT SHOW the Zen/24 had a lot of new vistors. Several had said they read some review on the Zen24 and wanted to see it in person. Many were impressed with the solar setup and the electric drive motor system, over all the whole environmental setup. The most common question was how long will it run under the electric motor ( about 5 hours at 5 knots). The second most asked question is how fast will it run? (hull speed is 6 knots). Another fairly common question has been how does it handle light winds and how does it handle heavy winds? 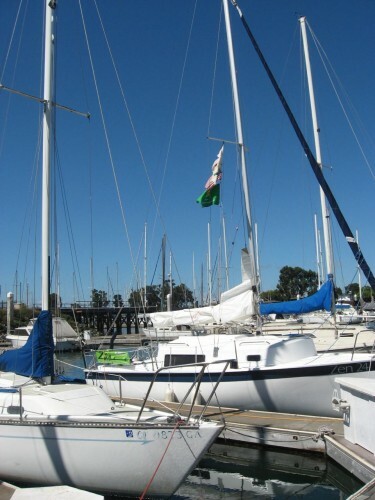 When explained to them that the ZenBoat was sailed in the San Francisco Bay with normal winds in the 20kt range with gusts of 25-30 knots the look of surprise and admiration is clearly visable. 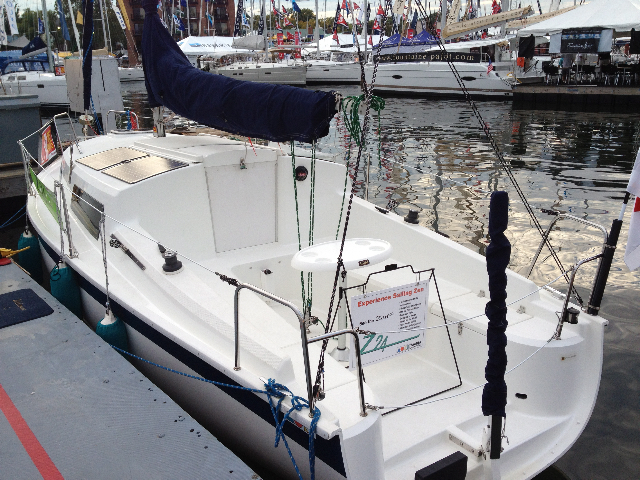 They were pleased to see the video and pictures of the Zen/24 under sailing under different conditions. Another impressive feature they liked was the head room. For a boat of 24 ft, the head room is surprising to many. There were many remarks about the simple, yet roomy interior. One does not have the feel of being in a 24 ft boat. 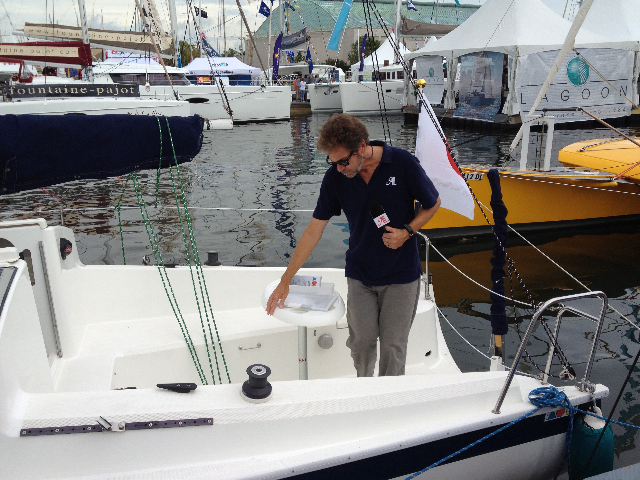 We have had two major sailing magazines stop by to take pictures and ask questions about the Zen/24. Both are planning to write a review of the ZenBoat. In a show full of a sea of large million dollar yachts the Zen 24 stands out as a boat for the everyday person and the family. The crowds at the show today (Sat) were large and varied with people from other countries in attendance, many of whom expressed an interest in making a point of visiting the ZenBoat. Several spoke of it being good for the boating world, it is the way of the future, and also it is about time this type of boat is made available. Yet, as impressive as the ZenBoat is to see, it is more impressive to sail. 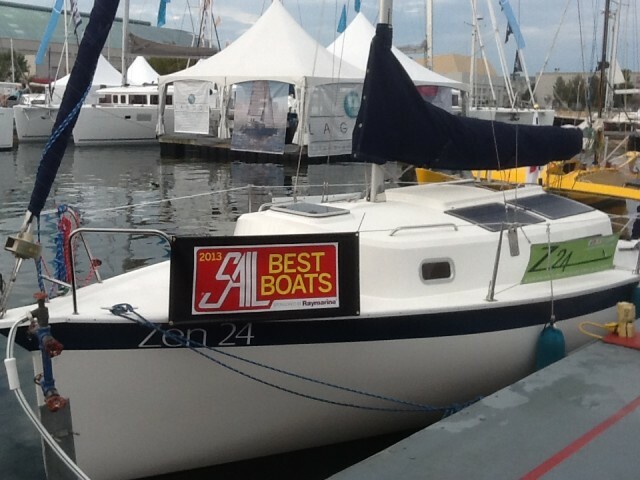 Come and see the Zen 24 at the dock B in US yacht show Oct. 4 to 8 at Annapolis. Check our extra roomy inside, electric inboad power and a new 48V solor charging system. Ask for a special show price! 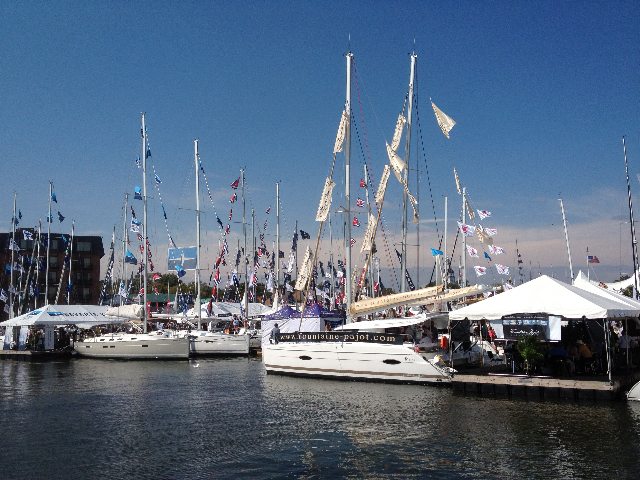 Oct Is here and the Annaoplis boat show is near at hand. With help from Yoh Sensei’s son we made the Zenboat ready to travel and show in Annapolis Maryland . In addition to cleaning, we installed the portapotti, raisers for the winches, and a set of solar panels which were mounted on the cabin top. These were special configuration assembled by Ganz-Eco energy co . The panels are semi-flexible and can be stepped on with no problem. That takes care of the charging problem while out all day motoring or when sitting for days without being plugged in to a power source. It also makes the Zen24 more self contained and more green. I think this is a major step in increasing the appeal of the boat. 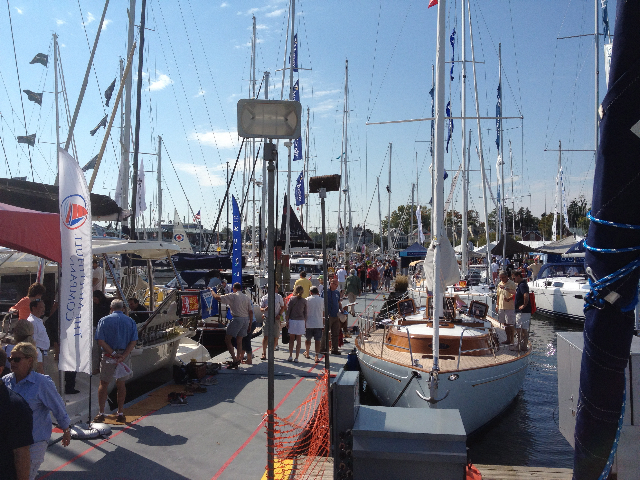 We are hopeful that the East Coast turns out to be a better venue for the Zenboat. Having so many more small places to explore and hangout perhaps this will be the place for this boat. We have two sailing magazines doing articles on the Zenboat, little by little we are getting more exposure to the public. What we really need ow is for someone to purchase one and have it be part of a sailing community. Preparing the boat for shipping took some effort, however the big effort was getting it settled on the flat bed truck. After it was already on the truck the driver decides that the wheels need to come off the trailer to lower the boat enough to be leak on the road. This took some real effort. Lucky I have some connections at the marine and was able to come up with two large floor jacks to raise the boat and the trailer up to remove the ties. The whole operation was scary. However we did it without anyone or the boat and me getting hurt! Yatta! As I write this I am on the plane flying to meet her in Annapolis. It was a grand and glorious summer day on Sat the 23. 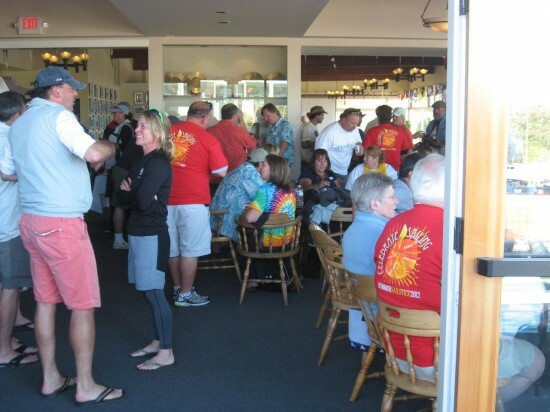 It was not the real summer solstice but it was the official celebration day for the summer sail event. I had been contacted by Capt Mary of Afterguard academy to take a few passengers and join in the sailing event for the day. The wind was perfect, we needed to reef for the Zen 24 but it was very comfortable after the sails were trimmed to the conditions. Unlike Sensei I was not trying to show how well the boat could handle stronger conditions. I just wanted a comfortable ride for my crew and me. When sailing you have a choice sometimes you can sail easy or rough. Little by little we made our way out of the estuary. It was slow going. Not because I could not get speed but I was suppose to bring up the rear with the group and I keep needing to slow down in order not to pass the others. 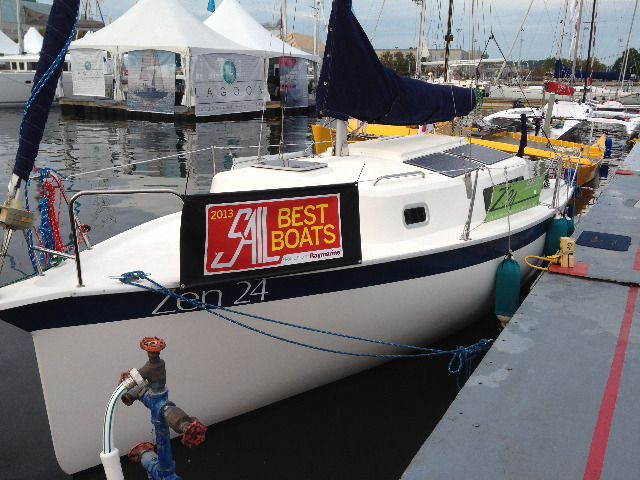 The Zen24 was faster than the other boats in the group. 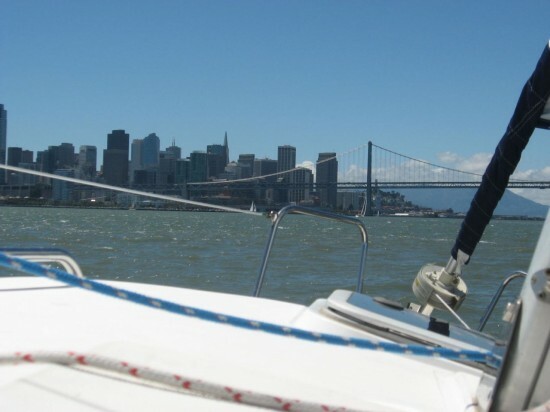 Once out on the Bay we had a very nice sail, no tacking just a smooth ride. That part was fun. There were a lot of boats out and about over in the slot where the winds are more intense. We however were not going that far out because we were, suppose to be joining the parade. Therefore we headed back down the estuary after a bit. Another reason was we needed to make a pit stop at Jack London since the Zen Boat head is not legal to use here in the States as yet. This is one of the changeovers needed bringing a boat from Japan. We made good time going back down the estuary since the wind was at our back. 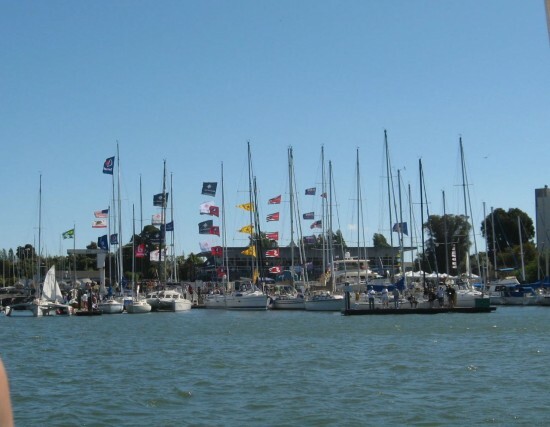 We stopped into Jack London for a quick bladder break, before heading down further to the summer Sailstice Headquarters at the Encinal Yacht Club. Our next move was to head back to the Afterguard office. There we, mostly me put the boat away for the evening. Announcements were made, awards issued, alcohol flowed, I left. It was a good day. I expect this event to double in size next year. 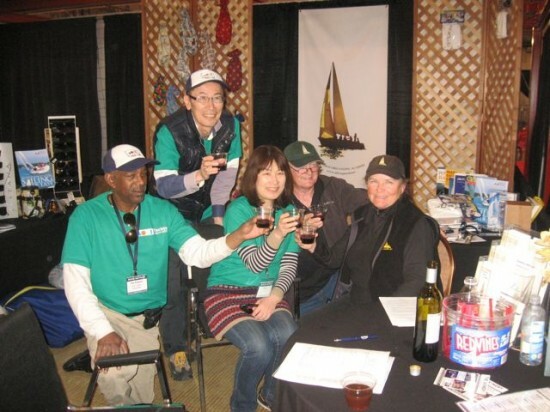 I hope to organize a Summer Sailstice event in Japan next year, under the sponsorship of AOKI Yacht club and corporation. 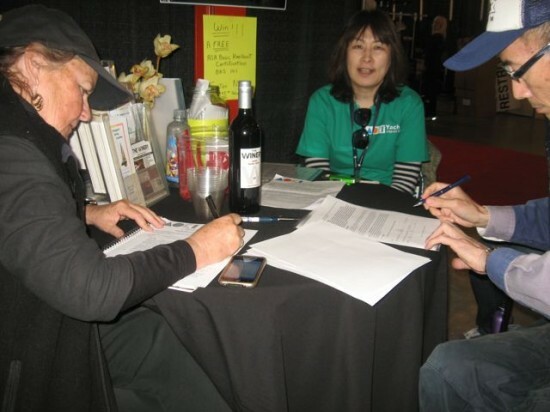 We can get more involved with the international sailing community as well as raise more Japanese interest..
After the All Sail Show at Jack London Square in Oakland Ca, Team Zen welcomed the first Sales Associate for the West Coast to the group. Captain Mary Swift-Swan. 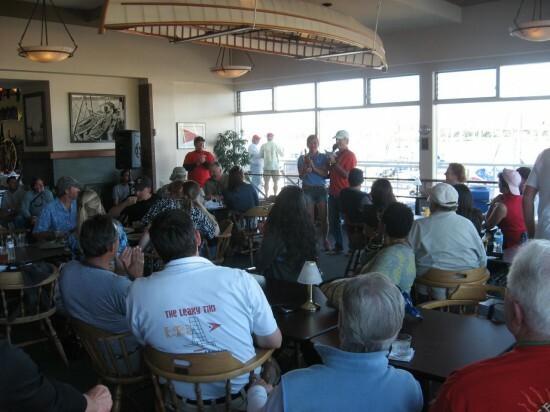 A well respected USCG Masters licensed holder, founder/owner of Afterguard Sailing Academy (www.afterguard.net), and co-author of the ASA sailing fundamental training manual. 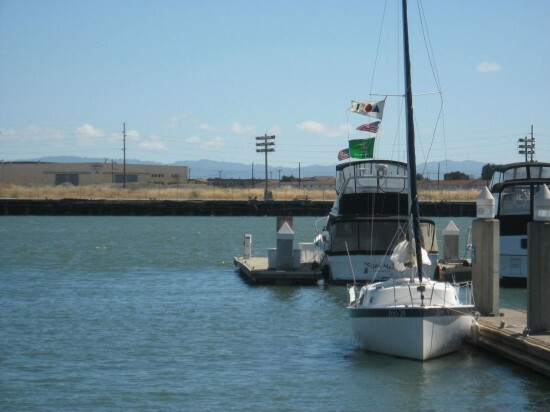 Captain Mary will be offering demo sails in and around the S.F. Bay on the Zen 24 sailboat. 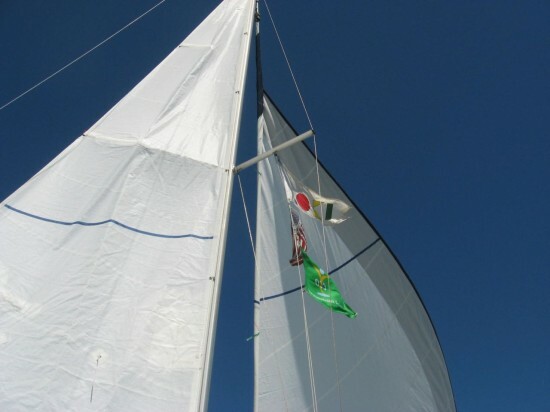 As an experienced sailor and teacher she understands the unique sailing characteristics of the Zen24. 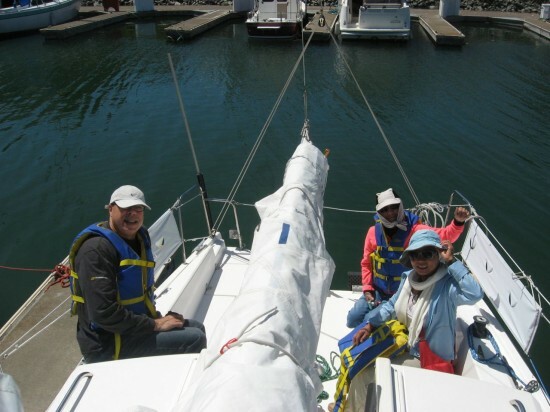 This puts her in the position to help demonstrate, educate, and train sailors in the above average qualities of the Zen24 to students, teachers and others who are interested in experiencing sailing Zen.